The client here loved English Antiques in all its Polished-Cotton glory. 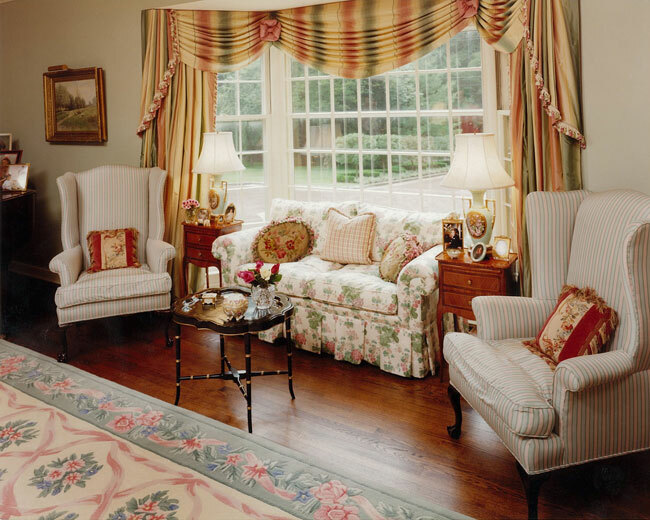 Here see Clarence House top-of-the-line Italian Silk Taffette Fabric used for the Swag and Jabot style window treatment. Oodles of fabric with exquisite Silk Tassle Fringe defining the drapery edges is a beautiful finishing touch. The unique and one-of-a-kind Throw Pillows that you see on the sofa and 2 wing chairs were born when I found the 17th Century French Tapestries on one of my scavenger hunts. Bordered by Antique tassle pom-poms, these pillows make such a statement. The Cocktail Table is an Antique Tray circa 1889 and is papier mache ( paper mache ). Its beauty, unfortunately, can not be realized in this photo.